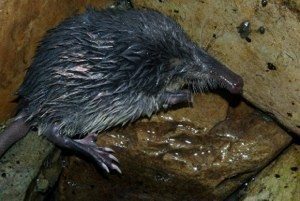 The Pyrenean desman (Galemys pyrenaicus) is a small semiaquatic nocturnal mammal related to moles and shrews, and is one of only two surviving species of the tribe Desmanini. The range of the species centers on northern Spain, but it is under threat due to changes to its habitat. Three great and dedicated basque and Spanish wilderness advocates here in Pamplona, made us aware of these lovely little animals living in clean rivers in the Pyrenees mountains. This already indicates why they are under extreme threat. The increasing water pollution is the single most danger to the few remaining individuals. We will report on these animals, the natura2000 areas in which they may survive and the efforts to safe the Galemys Pyrenaicus in one of our next issues of the European Wilderness Journal.